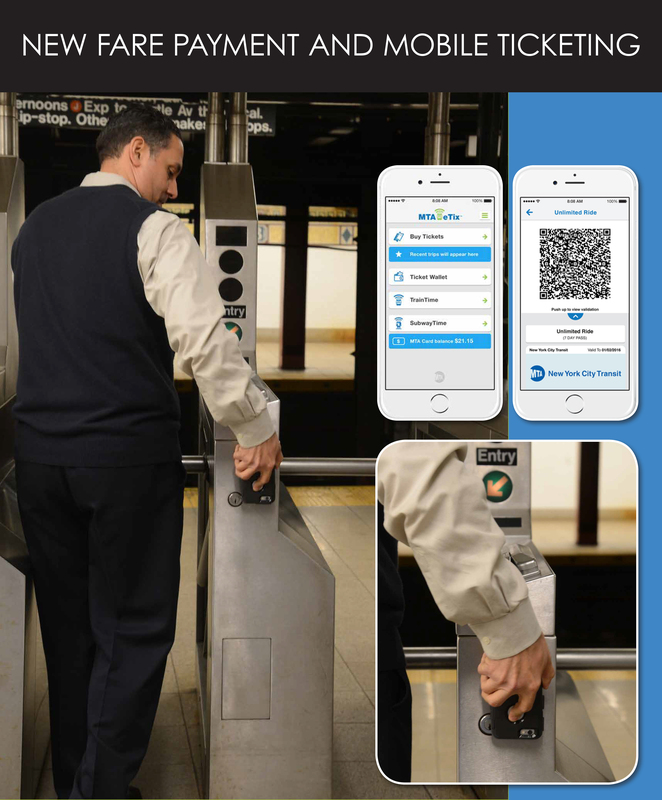 Governor Andrew Cuomo announced some design changes and upgrades for the subway this morning. I’ll have the details in a full post tonight, but to wet your whistle, an early glimpse at the renderings. Enjoy. Flip seats will allow for my car capacity at peak hours. Seems like a lot less area for seating. There is a large space between the edge of the door and where the seats start. Well, since people always stand in the doors and don’t move out of the way, moving the railings a foot on each side to give them a pocket makes sense. This way they can stand in the doorway without actually being in the way (mostly). Nope, just make the floor in that area 2.5 seconds after the doors open. Agreed. Makes sense to me. Definitely like seeing the route designations back. What a silly thing to get rid of, and it so retarded the character of the NYC subway. Now if only they could make the indoor lighting less hospital-like. The digital route signs are a great idea. Very useful. As for the bright lighting, I imagine the priorities there are safety and perceived safety, which are very important. The brightness is fine. That horrible white fluorescence is an ocular assault though. Whoever thought that was a good idea should be impaled, hung still wriggling in a public place, and then drawn and quartered as a message to everyone who thinks making transit users uncomfortable is okay. When I need to take the subway, I wear sunglasses even on cloudy/rainy days precisely because of the glare. I do too. I have a friend who makes fun of me for it. I don’t really think of the fluorescence as anymore than unpleasant, but it seems to actively hurt some people. But, safety, amirite? We might want to hold off on the drawing and quartering until we first tar and feather them. THEN draw and quarter them. Personally, I’d like to also add to the list of such persons the folks that came up with the ridiculous bus announcements about touching the tape and doors opening and closing and STEP AWAY FROM THE DOOR. If we are doomed to hearing those useless and annoying announcements in a male voice, can we at least get the guy that does the subway stop announcements? His voice on subway is not so grating as the bus announcements. Of course, the audio system on the bus might be the reason. Let me know when I should bring my brush. Agreed, the softer lighting in the older cars is so much more humane. The institutional glare of the stations and trains now is absolutely awful. Aside from the reduced seating and non-staggered doors, this design is excellent. It does seem like very little seating. And will those flip-downs last two days in actual use? Also, it looks like there’s a real shortage of handholds for people standing who are less that 6 feet tall. I think you’re going to see big crowds around the grab poles in front of the doors and the seat-end grips next to the doors. That will not be great for traffic flow. Are there systems using very similar car designs? Looking again, the car seems impossibly wide. This is a rendering, not a photo, right? If so, it’s misleading, probably by intent. Not impossibly wide I don’t think… the R32s are wider inside than a lot of newer models (or feel that way), which I always chalked up to a more efficient use of space… But I’m not positive. And will those flip-downs last two days in actual use? They’ll almost never be “up” but they should hold up just fine. 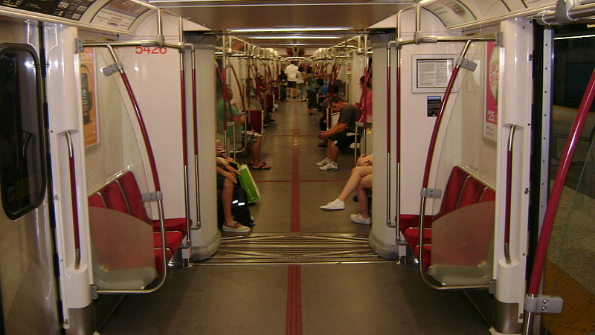 The R142 series cars have been operating with flip up seats for 16 years. Wait, what? I don’t ride the IRT so much these days but I don’t think I’ve ever seen those cars with the seats flipped up. OK, great, they must work. Thanks. Looks like from the renderings that those flip-up seats are to accommodate wheel chairs, which is a feature that the R-142’s have. Yes – I have seen them on the 4 and the 5 for a few years now. They make a lot of noise when being flipped… Aside from that they seem to work just fine. Even Metro North has them (I think it’s the M8 cars) and they work fine there too. So…did Cuomo finally do something worthwhile. Can we admit that? Or do we have to hate this initiative, because of him? Maybe, but it IS – partly – what residents have been asking for. It all sounds good, as far as I can tell. Not to say nothing more needs to be done, obviously, but still…good. Just because Cuomo is taking credit doesn’t mean any of this was his idea and/or decision. Eh, that’s kind of beside the point: most of what he’s gotten behind hasn’t been his idea, but it’s still notable what’s he decides to endorse. These are needed efforts, even if it doesn’t begin to address all of the other technical challenges the agency faces. Yeah, this is just another example of Cuomo treating the MTA as a state agency when there’s good news to announce, and then denying it’s a state agency when there’s bad news. The R-211 cars have been under development since at least 2011, it’s not like his office just came up with this. And if you think the governor’s office personally had *ANY* significant role in this, you’re crazy. I have been a vocal critic of Cuomo, but I’m willing to acknowledge that he MAY have had an important role here. Cuomo announced that 750 of the cars are to be open gangways, an about face from MTA’s plan to only order one 10-car set with open gangways. If Cuomo was truly behind this, he would legitimately deserve kudos for this. Agreed – if we complain we should also give credit when due. The bastards finally did it. They finally adopted global best practices. I can find very little wrong with these images. The only thing I could complain about would be the lack of plexiglass protection for the seats by the doors, rather than the metal tubes, to keep the rain out. And to be fair, very few metro systems have those. I’m especially intrigued about the experimentation with cost controls concerning the station modernizations. It will be interesting to see how well they can get contractors to shoulder over runs and, of course, if they can get the stuff done as quickly as they say. I very much see this as a shot across the bow. I don’t care if it IS to flatter Cuomo’s ego, if they can do the work as fast as they say, it bodes well for expansion, of these initiatives. I really wish they would move the grab bar to the middle of the car away from the door. The current design encourages too many people to stand by the door and not move in. This times a million. Has the MTA not read its own study on how people move in subway cars? Ridiculous. Yeah… I don’t see those flip seats being flipped up, ever. The general lack of seating in this design doesn’t doesn’t bode well. We already have fights over seating occasionally. I’m not sure why the gangways are so thin; if you buses that have to make 90 degree turns can have full width gangways with seating in them, so can the subway. Why does one shot show a door at the end of the car and another show an open gangway? Why are the poles in front of the doors instead of away from them? You want to encourage people to clear the way, not group up in front of the doors. Why aren’t the USB ports distributed throughout the car? Also, what kind of USB (since we are in the middle of going from USB 2 to 3 and from A to C type ports as standard). That would make sense. Can’t have that. Apparently, they’re only ordering a small number of open gangway trains, with the option to amend the order, at a later date, if they are satisfied with them. That is my understanding of the matter. As for why the gangway is so narrow, who knows? Hopefully it’s simply artistic license. What I read says 750 out of an order of 1025… That’s a large portion… Unless it is wrong…? Right, I believe they’re only ordering around 20 or so to begin with, if memory serves me right. The original plan was for a single set to be open gangway, and at the tail end of the order. This plan is a clear signal that this is no longer the intent. The addition of those leaning areas will help. 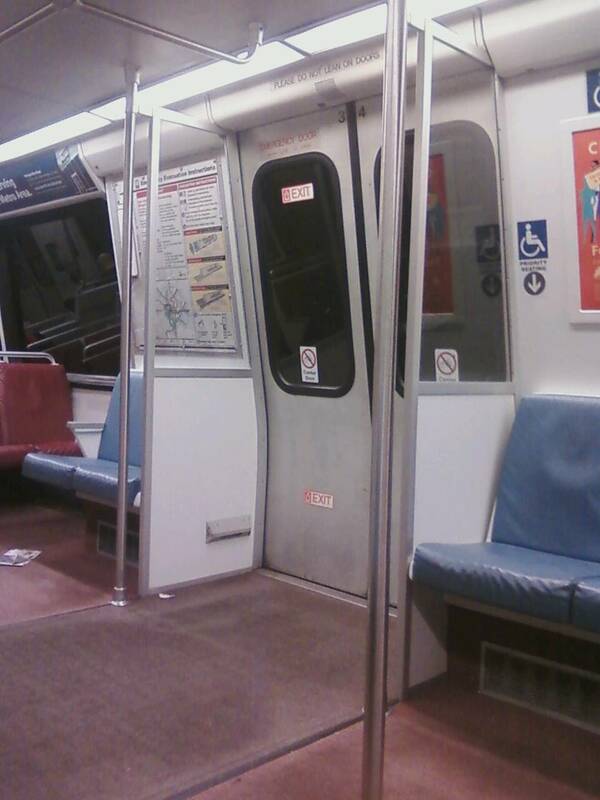 For a 10 car train, there will be four ends with doors. I believe due to ADA turning space reasons, the poles cant be in a different place. Very good point. The expectation is that this fall, all flagship phones will come with USB 3.0 with the new design. In 2-3 years, the existing USB standard will be dead. They will be useless. I understand using USB on trains, because they have lower voltage, but stations should simply be equipped with standard power outlets. Those are future proof, forever. The seats would be flipped up for Wheelchair passengers, not for crowding. The door end of the car is at the cab locations. The gangways are narrower so that there can be a rigid material at the open pass-through instead of the resilient material present on buses. This is due to a concern over vandalism. The flip seats on the IRT Lex cars are on a spring – if no one is using them they flip up on their own. I’m a daily commuter on the line, and I always stand at the end of the car next to the flip seats and have never seen a broken one. So that is not an issue. I think you’re seeing a door at the end of the car in one of the shots to depict what the first or last car in the train would look like. Somewhere from the great beyond, William Ronan smiles at the return of his beloved MTA blue stripe. For those commuters who travel from the boroughs this car just makes commuting harder. Instead of building more lines the state’s answer is turning the subway car into a cattle car. USB ports on subway cars is the dumbest idea I’ve ever seen. First of all, “standard” USB ports of today are already obsolete. They are being replaced by USB Type-C, as seen on many new phones and the new MacBook. And it will be something else in ten years. Technology moves too fast for this nonsense. New connectors come out every 6-12 years, while subway cars are supposed to last 40 years. Putting any kind of consumer tech port for the public in a subway car is extremely short-sighted. Also, USB ports are not designed for the abuse they will see in this kind of public setting. They will wear out quickly and/or become useless as soon as they are exposed to the inevitable gum/soda/vomit. These will be removed/disabled within five years, I guarantee it. They’re only meant for charging, in any case. For the life of me I can’t see the point in having USB ports on a subway car or even a bus. It’s just one more thing to get in the way of people, it needs to be maintained, there could be fights among passengers over the use of them, and on and on. It’s fine as long as they make the ports modular… Which of course they won’t. Why is everyone not raising much the same kind of big stink that we did for East Side Access over these station renovations? I mean, it’s nowhere near as useless, but it’s still a pretty ridiculous use of funds right now. The MTA is always pleading poverty. They keep raising fares overtly and by stealth (ie FunPass elimination, replacement card fees, cuts on bonuses, etc.). They instituted deep service cuts and have not brought them back. They take garbage cans out to save money. They’ve been delaying contactless entry for decades. Ridership is bursting at the seams and they’ll be signal upgrading for half a century. There’s still an enormous amount of fix and fortify left. They’ve got a new line to open. In light of all this, do we really need all these expensive, top-to-bottom station renovations? I don’t like the grittiness and grime, but I do like priorities, and right now, when things are stretched to the limit and we’re being asked to cough up ever more for less, my priority–and the priorities that riders have been telling the MTA loud and clear–is for service enhancements. Look, I’m as much an aesthete as the next New Yorker. I think the Penn Station demolition was a crime against humanity. But my priority right now isn’t that I having something I can show off to the “Joneses” (other metropolises) as worthy of a world-class city or whatever. It’s to get me from point A to B quickly and reliably. This seems like another elitist vanity gesture that makes public infrastructure improvements look like something for bourgeouis pride, removed from the needs of working people. Seems downright Orwellian to see these folks (only a bit before they next come to us pleading poverty, of course) talking capacity and service and other nuts-and-bolts, bottom-line, practical language right before unveiling and cooing over such vital improvements as glass instead of bar revolvers, ceilings to cover your head for an extra two seconds as you go down the stairs, and “conveniences” that riders have consistently rated as the absolute lowest priority. Those are not expensive details in and of themselves, of course; but they’re emblematic of the justification, and of the cluelessness, of a very expensive measure that we simply do not need right now, and cannot afford. The station renovations were in the capital plan. If you’re going to renovate a station you might as well do it right. As hard as it is to believe, most of the cost of renovating a station is in the finish or amenities. Also, from what I can tell, the replacement of the tiles and the introduction of new floors make these stations easier to keep clean. Actual proper route bullets! Okay that is nifty. Some of the news here (USB, wifi) is cosmetic and unnecessary, but if they are more aggressive at introducing open gangways that will be a great improvement… assuming they don’t hit some snag and end up needing to be taken out of service for a year because they don’t actually round curves properly (hey, it’s the MTA, they’ll find some way to screw it up). Wider doors… I withhold judgment on until I see them in action. I can see plus and minus here although if they are successful at reducing dwell times I won’t complain. Also nice to see the MTA adopting LED lighting. Such is a lot more efficient than the T12 fluorescents that are currently all over the place and will save money in the long run. Obviously an artist’s rendition without regard for practicality or policy. Curious how they’ll stay warm without heaters under the seats. And after T/O’s have gotten accustomed to full-width windows in front, I wonder how they’ll take to the half-width view again. No lights on the outside, near the doors, makes for a nice, sleek look but unlikely to see reality unless the role of the conductor changes. And finally, the absence of the black “Do not lean…”, “Stand clear…”, and “No..” decals gives it a friendlier, but unrealistic depiction. But the Vignelli map on the wall is nice. Ha! The Vignelli map. Didn’t catch that until I saw your comment. They should make sure to incorporate this in the new design. Classic case of putting lipstick on a pig. I’m also hard pressed to believe that most of these station changes he proposed will even happen. The dude promised countdown clocks what feels like a decade ago. How many stations will get these changes? I doubt many, the irony when these brand new cars pull into ever crumbling train stations or are stuck at a station for 30 minutes due to signal problems from the 1950s signaling system. I’d rather they dedicate those funds to fixing the crumbling infrastructure and expanding train service. Finish the 2nd Ave subway, start early on Phase 2, get funding for phase 3 etc. As for train interior design I’m all for Wifi, don’t care for USBs as the ports are ever changing and I just don’t have enough faith in the MTA keeping up with the times and upgrading in a timely manner anyway. I’d also remove some of the seats completely to create more standing room. For example I’d almost complete remove the seating on one side of the train and leave it for wheelchairs, stollers, standing, etc. I would however leave the end seats in tact(take the Q,N,R trains for example, those small two seaters opposite each other at the end of the car would remain on both sides) the large benches on one side would be removed. Open Gangways are great, but these are most needed on the IRT Lines, and this doesn’t seem to apply to these lines at all.